Recently many have looked to Benjamin Disraeli, Gladstone’s famous rival, as a guide to the future of conservatism. Disraeli helped to transform the Conservative Party, which Gladstone had long seemed poised to lead, by developing the idea of “Tory democracy”—a middle class conservatism based in the suburbs rather than in the landed gentry. Ever since its inception, Disraeli’s vision has been influential on both sides of the Atlantic. In this vein, Sam Tanenhaus—the liberal editor of the New York Review of Books, who has a hobbyist’s interest in conservatism—caused a minor stir by provocatively claiming that genuine conservatism had been embodied by Disraeli, and by Disraeli’s reading of Burke, and that Bill Clinton and Barack Obama were its true representatives. Gladstone, in contrast, is now associated mostly with the left, often for his support of foreign minorities and criticism of imperialism. Only briefly, thirty years ago, did he come back into vogue on the right, when Mrs. Thatcher and her free-marketeer allies cited him as an inspiration. Such neglect of Gladstone is a mistake. His policies and his principles should receive sustained attention from contemporary conservatives—and not only his classical liberal economics. He was a man of firm small-government convictions, who made his vision politically effective. His politics of prudence transcends his age, grounded in a timeless conception of human nature. A lifelong student of Aristotle and Burke, Gladstone became a statesman who recognized the force of circumstance, skilled at managing the necessity of change in order to maintain the public interest. It is doubtful whether his political development from a self-described “out-and-out inequalitarian” into a backer of “the masses against the classes” reflected a fundamental change of philosophy, rather than a persistent outlook applied to a world in motion. Displaying genuine leadership, Gladstone’s record lacks the traces of romanticism and reactive historicism that taint Disraeli’s legacy. As a colossus in an age of political giants, Gladstone came to be the chief architect of his country’s prosperity, providing the economic foundations for maintaining the Pax Britannica. First entering government in the 1830s, he went on to serve four times each as Chancellor (finance minister) and Prime Minister. In 1894, after six decades in public life, he left 10 Downing Street for the last time. Gladstone followed Canning to Eton (where his father would regularly send him parcels of wine, earning him the nickname “Mr. Tipple”), and to Oxford, where he graduated with a Double First in Classics and Mathematics. Afterwards, emulating aristocratic custom, Gladstone spent six months on the Grand Tour. He had briefly considered the clergy, and planned to study law in preparation for a political career. Meanwhile, however, a seat in the newly reformed House of Commons opened up. On the strength of his performance at the Oxford Union, Gladstone was asked to stand. Aged twenty-two, he was duly elected as a Tory. Soon Gladstone found himself at the center of action. Partly, of course, he was at the mercy of developments, but he also began to shape and guide things himself, taking advantage of opportunity. As he moved with the times, and as the times moved with him, Gladstone’s career followed more or less three stages, roughly corresponding to his membership of Tory-Conservative, Whig-Radical, and Liberal governments. Initially, Gladstone retained his skepticism of the 1832 Parliamentary Reform Act as a “revolution” rather than a legitimate attempt to restore “the balance of the principles” of the constitution. In the Commons he also defended the West Indian plantation owners, despite the fact that not all of them had given full effect to the Empire’s prohibition of slavery. Both stances would embarrass him later. Nevertheless, his impressive performance attracted the attention of the Tory Prime Minister, Sir Robert Peel, who made him a junior minister in his short-lived first administration. Outside of government Gladstone spent the 1830s in search of a wife, eventually marrying Catherine Glynne, who shared his religiosity, and who provided important links to the aristocracy. He also further developed his religious and political beliefs, discussing their intersection in his first book, The State in its Relations with the Church, aiming to “make the case” for an established church, understood as an active, guiding connection between the nation’s spiritual and civil powers. Invoking Burke, Coleridge, and many Greek and Roman writers, Gladstone argued for an organic conception of society, naturally linking nationality and religion. Contrary to claims by Macaulay—who infamously proclaimed Gladstone “the rising hope of those stern and unbending Tories”—he stopped short of advocating a theocracy. Instead, Gladstone surveyed the range of options between a completely secular state and a theocracy, accepting situations which would disqualify establishment. However, he argued that these did not exist anywhere in the United Kingdom—not even in Ireland. In his second government Peel promoted Gladstone to Vice-President and then President of the Board of Trade, placing him in the Cabinet at age thirty-three. As a result, Gladstone was at the heart of economic policy, which centered upon the controversy about tariffs—the notorious Corn Laws. Immersing himself in the details of the issue, he soon became a convinced free trader, vigorously supporting Peel’s economic reforms against the majority of protectionists within his own party, including Disraeli. However, when the government decided to renew the grant to Maynooth College, an Irish Catholic institution, Gladstone resigned, as the policy conflicted with his vision of church-state relations. A crisis of conscience followed. Should he compromise his beliefs in order to return to politics; should he refuse office to stay true to them; or should he try to implement them in a different way? Gladstone somehow decided to stay in politics, accepting Peel’s offer to become Colonial Secretary later that same year. In this position he encouraged the settlement of British peoples overseas, promoting them as communities capable of governing and maintaining themselves. Peel eventually succeeded in abolishing the Corn Laws (1846), but not without the cost of splitting the Conservative Party. Personal recriminations followed, and the Peelites drifted increasingly further from the Conservatives, hovering between Tories, Whigs, and Radicals, being courted by all sides. In this setting, during the 1850s and 1860s, Gladstone served multiple times as Chancellor in coalitions of Peelites, Whigs, and Radicals. Inventing the issue of “Finance”—to the point of being identified with it—he duly transformed Britain’s economy, relentlessly advancing Peel’s reforms with policies of free trade, reduction of overall taxation, retrenchment, and regulatory reform. All were aimed at creating a framework for free market prosperity, supported by a minimal state. His decision to serve a second time as the coalition’s Chancellor burnt his last bridge to the Conservatives. Gladstone was now the biggest beast on the progressive side of politics. In his private life, too, the 1850s and 1860s were a tremendously important period. Gladstone’s marriage, generally considered to have been happy and affectionate, had produced several children. In addition, with the knowledge and cooperation of his wife, during these years he engaged in Christian “rescue work” of prostitutes, many of whom were invited to visit the Gladstones at their home. Most of them he found on the streets, but some were courtesans. In 1868 Gladstone made his debut as Prime Minister, heading Britain’s first Liberal government. It was also the first government elected after the Conservatives had passed the Second Reform Act (1867), which extended voting rights further than Gladstone had thought appropriate. Nevertheless, this new administration solidified his agenda of reform. Economic policy remained important, but the legislative program went further: disestablishing the Irish Church; reforming Irish land and universities; reforming education in England and Scotland; and introducing examinations that opened the civil service and the armed forces to merit. 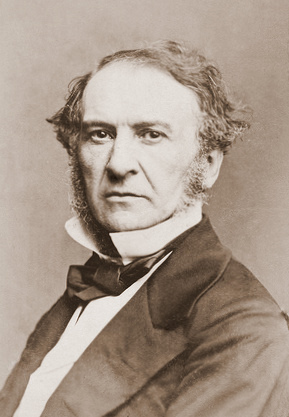 Briefly serving simultaneously as Prime Minister and again as Chancellor, Gladstone also tried to make abolition of the income tax the issue of the 1874 general election. Disraeli quickly foiled this attempt by promising to do the same. If Gladstone’s political career had ended at this point (as he had expected and intended), his name would have been made as Chancellor. The issue of “Finance” that came from his Chancellorship had consciously served four purposes: furthering Gladstone’s political career; lifting all boats in a rising tide, thus keeping class conflict at bay; and encouraging self-government for those who proved themselves capable of it. In this way, Gladstone’s key political platform connected the issues of wealth creation, social opportunity, the balance between indirect and direct taxation, the question of extending voting rights, and even foreign policy, since free trade was as much intended to create wealth as to help generate peace and international cooperation. As Prime Minister he had ensured that his Treasury policies were kept in place, giving them yet more time to bear fruit. In this respect Gladstone was largely responsible for creating and maintaining a consensus that would last from the mid-nineteenth century until World War I. Eventually, Gladstone led three more governments in old age—at one point again serving simultaneously as Chancellor and Prime Minister. However, none was as successful as his first. They were dominated by frustrated attempts to pacify Ireland, further extension of voting rights, and renewed protectionism abroad. Foreign policy, too, was troubled. Minus Disraeli’s romantic rhetoric of Empire, it did not differ fundamentally from that of the Conservatives, much as Disraeli and the Conservatives had earlier come to accept Gladstone’s economic consensus. In the end Gladstone’s political life came to a close soon after his second attempt at Irish Home Rule had failed. Increasingly frustrated by health problems (including declining eyesight), and fruitlessly fighting his Cabinet colleagues in a characteristic attempt to reduce naval expenditures, Gladstone resigned as Prime Minister for the last time. His final Cabinet meeting proved a tearful spectacle—much to the scorn of the great man himself, who remained stoic throughout, and who afterwards referred to the episode as “the blubbering Cabinet”. His resignation still a secret (except to the Cabinet and to his immediate family), during the afternoon of that same day Gladstone conducted Question Time in the Commons as if nothing had happened. He then left the House, never to set foot in Parliament again. Nonetheless, Gladstone never came to believe in freedom without both hierarchy and authority, sustained by Christian morality, and he never abandoned an organic conception of society. Throughout his life he praised Dante, Augustine, Aristotle, and Butler as the “four Doctors” who guided him, appending Burke to the list, while rejecting Bentham and both Mills. During a chat with John Morley, his friend and official biographer, Gladstone (then in his eighties) claimed to be “of the same mind, and perhaps for the same sort of reason, as Joseph de Maistre, that contempt for Locke is the beginning of knowledge.” Much like another friend, Lord Acton, he remained skeptical about abstract rights, instead believing in natural and divine law, duties and obligations, and historically-grown liberties. However, such respect for circumstances never tempted Gladstone to historicism, and his skepticism of the romantic strain of Toryism (long popular in the Conservative Party) contributed to his ‘progressive’ shift. Thus, he introduced reform measures in terms of restoration, and attempted to pacify Ireland by showing its people that they could work through existing institutions. Similarly, Gladstone’s reluctance to extend voting rights, and his dislike of the income tax, derived from his fear of their potentially disruptive effects on the existing social order. Virtue was necessary to sustain this politics of prudence, both on the part of the people (provided by Christianity), and in its leading classes. Accordingly, Gladstone saw the aristocracy and the monarchy as legitimate forces in society and in government, but only as long as they lived up to their duties. A traditional liberal education, centered upon the Classics and Christianity, was his preferred test of virtue, producing Homeric Christian gentlemen. There is no doubt that he tried to live his own life in this way, to the point of physically punishing himself for his sins. Indeed, some might suspect that Gladstone used Christianity’s conception of sin as an anchor, correcting what the ancients would have called an excess of virtue in a man of his talent and energy. But that is certainly not how he saw things. In this sense at least Gladstone was far from hypocrisy, despite the sometimes thin line between prudence and political opportunism. Was it prudent or merely opportunistic not to rejoin the Tories, facing a future of competition with Disraeli on the same benches, while he was confident that his only two rivals outside the Conservative Party would soon leave the scene? One must avoid “sinking into a party man … instead of man in politics,” he had written in his first book, and it served him well. The Liberal Party emerged around him precisely because he was an outsider: he did not fully belong to any of the contending progressive factions, and the Peelites had dissolved as a separate group. Arguably, Gladstone remained a “Canningite” throughout his career—a liberal Tory, paradoxically skeptical of reform, yet at home with Peel. In our time Gladstone’s politics tend to lack a natural constituency. The Victorian political culture that allowed for such a man is gone, of course, and so is the society he governed. Sadly, many classical liberals would consider Gladstone too conservative in his reasoning; whereas conservatives tend to read too much into his association with the Liberal Party. If we wanted to extrapolate Gladstone’s policies, we should start by noting his fierce opposition to anything resembling a welfare state, right until the very end. As long as he remained in politics, he fought to keep socialism at bay. Once he left, the Liberal Party became a different animal. It is more difficult to speculate how his principles could apply to current problems. Clearly, his particular variant of the politics of prudence—call it liberal inequalitarianism—would be unfeasible in our democratic age, as he himself would have been the first to recognize. Even so, Tocqueville—a philosopher he met, read, and considered “the nearest French approach to Burke,” and who on matters of statesmanship once described himself “in heart and spirit with … Mr. Gladstone”—successfully translated his own aristocratic liberalism into a democratic context, with the help of America’s example. Indeed, Gladstone much admired America. Political prudence, in his eyes, always consisted in recognizing man’s inherent limitations as fallen creatures. Institutions, and institutional reform, had to be understood in that light. A good statesman prepared for the opportunity to do what was right; seized the opportunity if it came along; or resigned. Melvin Schut received his Ph.D. from the University of Chicago. He teaches law and legal philosophy at Leiden University Law School (The Netherlands). A shorter version of this essay appeared in the June 2010 issue of The American Conservative.